We Act Radio broadcasts from east of the Anacostia River in Washington, DC. A short distance to the east on Good Hope Road is the Anacostia branch of the public library. A few blocks away, African Heritage Dancers and Drummers teach all ages. And just around the corner from us is Anacostia Arts Center where a range of art and community programs take place. Right here at We Act Radio, opportunities for community learning, sharing, and celebration abound. A few blocks to our south on MLK Avenue is America’s Islamic Heritage Museum. In addition to regular programming, the Museum is currently offering a series of Narrative Hours, including stories from scripture as well as an invitation to individuals to share their own experiences of bigotry, bullying, and harassment. Jazz and Tea Summer Sundays offer a different sort of opportunity to cool off, connect with neighbors, and enjoy music. Some of these opportunities are relatively new to the area. Some have been here for decades. The area east of the river is full of people sharing their creativity, knowledge, and interests. 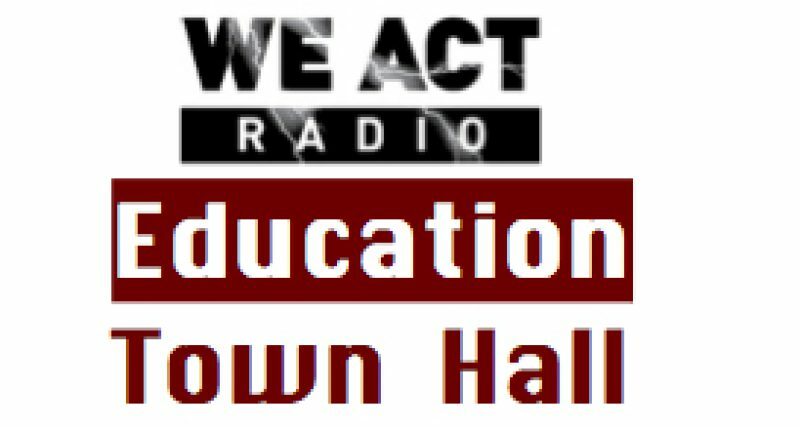 With all that in mind, the Education Town Hall often discusses the enormous disparities – in housing and crime and poverty, in educational opportunities and attainment – between this part of the city and areas west of the river. Access to books varies hugely between neighborhoods east and west of the river, as discussed in the last feature report, and for all the culture around us, we are here in a severe book desert. Research, also highlighted last time, suggests that lack of access to books influences literacy and reading enjoyment. Illiteracy, in turn, is associated with a greater chance for unemployment, incarceration, and other negative life circumstances. There is a lot east of the river. But reading and books are conspicuously absent, compared with the rest of the city, for a host of current and historical reasons. Low literacy creates challenges for people in obtaining medical care, taking prescribed medicine, grocery shopping, on worksites and in applying for jobs, interacting with government and banks, for adults interacting with their children’s schools, and for adults seeking to improve their own educations. Washington, DC has been among the “most literate” cities in the U.S. since professor John W. Miller, who joins the Education Town Hall this morning, began studying literacy and literate behaviors around the world. The study – which we’ll learn more about later in the show – looks at educational levels, newspaper circulation, internet reading, bookstores, libraries, and publications of journals and magazines. After several years in the top ten “most literate” cities in the U.S., DC has topped the list since 2009. And yet, as we know, that rating tells only part of the story for DC – and for many other cities around the country. We are not the only city with numerous universities AND a struggling pre-K – 12 school system, with a culture built around words in one area of town and a book desert on the other. 29th in the world in terms of library access. Reading is not our only bridge to stories and ideas from past generations and other cultures. But inability to read fluently cuts off important access points. Reading remains an important portal to knowledge for life and career. Moreover, studies show that reading fiction – not necessarily a plot-focused thriller, but a story that explores human emotions and motives – promotes empathy, especially with people different from the reader. As mentioned in the last feature report, We Act Radio is in the midst of launching the Charnice Milton Community Bookstore here at the station. Named for my colleague, the 27-year-old journalist and book lover who was shot to death in 2015 – this new bookstore will be the first east of the river source of children’s books in many years, seeking to address the book desert here and its effects in the community. The bookstore also aims to serve as a center for intellectual exchange, with a focus on the needs and interests of surrounding communities. Stay tuned, as this project develops and as we continue to explore literacy, book access, and related topics.